Many startup business owners have a passion to start a business and rarely do we do our due diligence before starting and often find ourselves doing all the wrong things and suffer a financial hit because of our lack of research in the industry. In today’s episode, you will find out how a simple tool SWOT can help prevent many mistakes. Kathryn : And I am your cohost Kathryn. Rachel : So today we wanted to talk about the SWOT analysis and how you can couple that with marketing and design and SWOT stands for strength, weaknesses, opportunities, and threats. So Kathryn, what have you done to use the SWOT analysis tool? Kathryn : I use SWOT analysis to help me decide on collateral for different brands and for how we were going to market those brands. Rachel : Okay, great. So when we’re talking about marketing, we’re talking about looking at the internal and external and the internals is to strengthen the weaknesses. So let’s start there with the internal strengths and weaknesses of, let’s say a company. Okay. So they have a great solid brand. They have great solid products and these are the strengths. So what would we consider Kathryn a strength? Kathryn : So let’s use this with an example. We’ll call it company A and they will be in the food industry. So for company A with strengths, you want to determine like what did they do better than their competition? What does the company do well, what is there internally sources, some tangible attributes to company has, etc. And also with company A being in the food industry will say that they’re vegan. So from those examples, what did they do better? Well we could say company a only catered to people who are lactose intolerant and want a healthier diet. That’s a strength. What does company A do well? Well, they make everything from scratch. They naturally grow their products and they make the prices more affordable than other vegans see those are strengths that company A has. Rachel : And versus their competitors? And then what would we consider than a weakness? What their weaknesses is maybe their messaging is wrong, is not quite the way it should be, where they’re not pulling in. Like in other words, they have strengths which is that they have a market but their marketing messaging is not to it’s maximum so that they can pull in a lot more revenue than they should be. You know what I’m saying? So maybe it could be like what we were talking about collateral, maybe their collateral or their website, things are just. There’s a lot of disparity in between so they’re messaging as a whole is just incongruent. We’re going to go out and into the external portion which is opportunities and threats and I would say that an opportunity is that there is a market for it. Okay. And there is a possibility that we can add not only that one market, but we can also probably tap into those who are not necessarily lactose intolerant because I know that a lot of the times when we change, like we have to admit food is really good, especially when you have the butter or the fats and all that kind of stuff. But now when you’re going into a more controlled, healthier type of foods, sometimes they might not be as tasty and it changes the taste of the foods. I know that you’ve had that issue, like you love ice cream, but yet you’re not a fan of the soy base. You’re not a fan of the coconut base. You’re not a fan of that. So that kind of deters you. Okay. You see, I like coconut so I don’t mind the coconut, but I don’t like, although I’m not lactose intolerant, I would have the coconut base, but I would not have the soy base because I don’t like the taste of it. So an opportunity would be that they can actually make their foods tastes really well. And they can add a great ingredients that would enhance their foods and that’s a great opportunity and by doing this, now when I’m going to opportunities, by doing this, they can attract not only the Vegan and the lactose intolerant market, but they can also pull in someone like myself who I don’t have any of those issues and I don’t mind eating either one, as long as it tastes good, I don’t care, you understand? So that would be for me an opportunity and maybe they can even, let’s say another opportunity is that they can also cater to the younger because now there is, if they had products that would cater to the younger, now they have a broader market you understand? And another opportunity in this case can be that they can also package these products and actually ship them. That’s another opportunity for someone like this, okay. That they now you not only are captivating the audience around locally, but you can actually ship it out. So you’d have a wider variety of people that you can cater to. So what would you consider a threat Kathryn? Kathryn : Some threats could be if they have any emerging competitors, maybe somebody else notices this need in the market space, and they’re also working to create a restaurant company, products, etc. just like company A or there could be maybe negative press and media coverage. So those who want a healthier lifestyle, they tend to be against animal cruelty. And so depending on how company A makes their food and depending on how they grow their animals and feed them could determine how people will see this company if they’ll see them in a positive light or in a negative light, and if it’s a negative light that can potentially threaten their company. Rachel : Right? Right. Okay. So these are all things that we need to look. Let me explain to you something is what I love about SWOT, and the reason why we use this in our marketing and design for our clients is because i’m not going to say that this is the end all, be all. This is just a baseline. And what I mean by a baseline is that this is just the beginning processes that can ignite possibilities for a great brand and marketing strategy. So what you have to do is you have to when we’re planning for anything, right? Kathryn what do we do? We say, okay, we tend to do this in the normal. We just don’t realize that we’re using the SWOT analysis. So anything that we plan on, we say, okay, what are the pros and what are the cons we use our pros and pros and cons, of making a specific decision, right? So what do we do? We say, well, these are great possibilities and these are the what ifs. If this happens, then you know, this is a con and this could be this kind of go against us, but there’s always pros and cons in everything. So what you do is you try to prepare for those things. But what I love is that analysis gives you that guideline to say, okay, especially when we’re building brands for our clients, should we go any further? Rather than putting out I’ve known people who put out a lot of money in a brand not knowing if it’s gonna actually work, not knowing if it’s going to be something that’s there’s even a market for. Okay. So rather than even spending money, time and energy, it’s Kind of good to go to this, what we call the SWOT analysis because it allows you to get your feet wet and kind of see, okay, now should I go any further? Should I spend any more time on this particular brand, product or service? Is this going to result residual income? Is this going to result me in getting a better clientele growing my business? You see, so what I like is that is just the baseline. Now, if, once we go through this beginning, these are like the first steps. It’s almost like, this is what we ask our clients these questions. So when we do this, what we do is this gives us the opportunity of, okay, we’ve found this out, and this is going to be your issue. Do you want to move further? Do you want to go dive deeper into this? So again, I know a lot of people use the steeple and they feel that the SWOT analysis is not as strong, but I guess maybe the way we’ve used it, we found it useful because again, it’s just the beginning process and then at that point once we decide is this a possibility, then we can move deeper into the other analysis where we can now say, okay, let’s dive deeper. So that’s why I love the SWOT analysis. So guys, before you spend a lot of time and energy on any planning process, I think that the SWOT analysis is a great tool for you to use to ask those questions and to see if this is going to be something that you can use in the future. What would you say, Kathryn? What would you like to add to that SWOT? Kathryn : Yes. 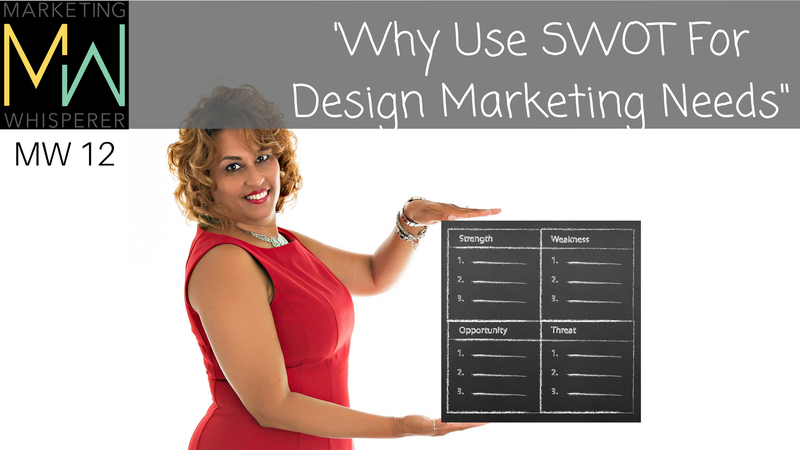 SWOT is very critical in determining the best design for a full brand with collateral and marketing materials and tactics. So you want to just use this tool to help maximize your deliverables in your company. Rachel : That’s awesome. See guys today, I just want you guys to understand that SWOT is really important as much as some people just kind of throw this out and I know a lot of people really don’t use this process, but it will make your planning process a whole lot easier. So I hope you guys took something away today. I know this was a very short show, but really dive a little deeper. Look at the SWOT analysis and use that, like Kathryn said, to your full advantage and this will assist you in really thinking of either diving deeper into this marketing strategy or brand or table it, scratch it and then start again. So I hope you guys enjoy today’s episode here on the Marketing Whisperer podcast and we will catch you in the next episode.